Fermented foods are essential to introduce to the GAPS diet from the very beginning and kefir can be managed after whey and yoghurt have been successfully introduced. Supplementing with probiotics in general will allow beneficial flora to do its job primarily in the upper parts of the digestive system which does not generally reach all the way down to the lower bowel however, fermented dairy will carry probiotic microbes all the way down to the end of the digestive system. Whilst yoghurt carries some very beneficial forms of beneficial flora, Kefir has been known to carry colonies as large as 27 different strains or more, many of them of which have great yeast killing properties. Fermentation predigests the dairy, making it easy for our digestive systems to handle, that is why fermented foods are easily digested by people who have digestive disorders. Fermentation releases nutrients from the food, making them more bio-available for the body. You can get a commercial Kefir starter in a sachet or use some live fresh kefir grains as a starter. If you make kefir from organic unpasteurised (raw) milk, then do not heat it, just add the starter and ferment it on the bench. Only pasteurised milk needs heating, as pasteurisation makes milk vulnerable to contamination by pathogenic microbes. Raw milk is usually well protected by its own probiotic bacteria and other factors. Remember, that kefir contains more potent probiotic microbes than yoghurt, as a result kefir will produce a more pronounced “die-off reaction”. That it is recommended to introduce yoghurt first, then start introducing kefir. Both should be introduced slowly and gradually controlling the “die-off”. Kefir, apart from probiotic bacteria, contains beneficial yeasts. That is why it is essential to introduce for people with yeast overgrowth. A healthy human gut contains plenty of beneficial yeasts, as well as beneficial bacteria and other microbes. In order to get rid of the “bad” yeast, we need to replace it with the “good” yeast. By dripping your kefir through cheesecloth you can separate it into cottage cheese and whey. Pour the whey into a clean glass jar with a tight lid and keep it in the refrigerator to use as a starter for fermenting different foods, such as vegetables, fish, beans and grains (when your patient is ready to have them). The cottage cheese is delicious with some honey, fruit, soups or as a savoury snack. Kefir is a health promoting fermented dairy drink, similar to yoghurt but slightly tangier and much stronger. While yoghurt usually contains only two or three strains of bacteria, kefir contains a much wider variety of friendly micro organisms, including beneficial yeasts, some of which can break down lactose [milk sugar]. Kefir is a probiotic beverage made with either Real Kefir Grains or a powdered Kefir Starter Culture. There are two types of grains, Milk Kefir Grains and Water Kefir Grains. Milk (dairy) Kefir culture can be used with cow milk, goat milk or coconut milk. Water Kefir Grains can be used with sugar water, juice or coconut water. Kefir Grains consist of bacteria and yeast existing in a symbiotic relationship. The term “Grains” describes the look of the culture only. The culture does not contain actual “grains” such as wheat, rye, etc. Real kefir is kefir prepared in the traditional fashion, starting off with kefir grains. Store bought kefir, on the other hand, is produced by culturing pasteurised milk with a limited number and species of organisms, which are strategically selected to imitate the flavour and texture of the real thing, but with limited properties. In particular, commercial kefir cannot be used to make new kefir on a continuous basis, because the culture inevitably loses viability. Kefir grains, instead, can continue to produce fresh kefir on an indefinite basis. Also, distinctive scientifically proved therapeutic properties of the actual kefir grains, when ingested, which enhance health, are not possible with the use of commercial kefir or a kefir prepared with commercial starter-cultures. Kefir grains are a biological mass synthesized [created] by colonies of micro organisms living together [symbiotically] to form a polysaccharide mass, which form into lumps similar in appearance to cauliflower rosettes. Grain size varies from the size of wheat kernels to that of a golf ball or larger. Once placed in fresh milk, the grains [also referred to as a natural starter-culture or starter-culture], transform the milk into kefir within app. 24 hours. The same grains (or culture) are used for the next batch, to continue the ongoing process. Where did Kefir Grains Originate? The grains originated in the Northern Caucasus Mountain region, where local people have been using the culture for centuries – perhaps for up to one and half to two thousand years. It is said that the people of this region were gifted kefir grains from Allah, or God. At the beginning of the 20th century, Russian nobel prize winner E. Mechnikov investigated the grain’s health promoting properties. This initially brought much interest in the product to the people of former USSR, which followed on to the the rest of the world. Why should I drink Kefir? Is it healthy? 1. Kefir grains contain a vast amount of micro-organisms from 4 genus groups, including lactic acid bacteria and yeasts. The distinctive microflora of kefir is compatible with the needs of our body. Kefir micro-organisms are able to stabilize or balance the Gastro Intestinal tract, as well as ensuring better digestion and fight off harmful bacteria, yeasts [including those which cause stomach ulcers, diarrhea, and yeast infection] and viruses. The consumption of kefir has proven to stimulate the immune system, which can also assist the cells of the body to increase the production of interferon [virus controlling agent] due to a unique lipid [sphingomyelin] found in kefir. 2. 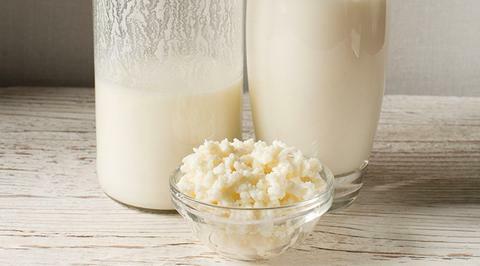 Kefir may provide other benefits: the friendly micro-organisms breakdown substances such as lactose in milk and from, this synthesize favourable substances, including lactic acid and “Kefiran”, a health promoting polysaccharide unique to kefir grains and to kefir. Kefiran has proven to reduce the size of certain cancers, including having anti-inflammatory properties. Certain organisms of kefir produce lactase, an enzyme which breaks down lactose [milk sugar], which provides the body the ability to further breakdown any milk-sugar [lactose] in the diet, while taking kefir with that meal. OK, I have some kefir grains, so how do I prepare kefir? Basically, just put two to three tablespoons of kefir grains in a half litre [1 pint] of fresh milk, and leave at room temperature for 24 hours. For greater or smaller quantities, vary the proportions accordingly. Unlike yoghurt, the milk with the added culture does not need to be heated and kept warm during incubation. Nor does it need to be boiled first [to sterilize or pasteurize]. Actually, brewing at a cooler temperature makes a smoother kefir [but takes a little longer to brew]. Once the kefir is ready, strain through a plastic colander or sieve and plop the grains into more fresh milk to prepare the next batch. This process is simply repeated. Should I sterilise all utensils? While cleanliness is always important in the kitchen, it is not necessary to go as far as to maintain a sterile environment when preparing kefir, since kefir grains are hardy and survive quite well in the kitchen environment. However, try avoiding non-stainless steel metal utensils, because the acidity of the kefir may cause corrosion. To avoid problems, you could opt to use only glass, plastic, nylon or wooden utensils. Should I rinse the grains with water between each milk change? This is not necessary. But if you really want to, you can “fast” the grains by placing them in filtered water for one day [one part kefir grains to 3 part water as a general rule]. The grains are then strained and placed directly in fresh milk to prepare kefir as per usual [explained above]. This can be performed once weekly, fortnightly or monthly. The water strained from soaking the grains contains Kefiran, a unique healthy polysaccharide native to kefir grains. Dom, the list owner has given a uniquie name for this solution “Kefiraride”, which has a variety of applications. I’ve never had kefir. What do I need to know beforehand? Certain individuals may have a reaction when first consuming kefir, similar to the Herxheimer reaction. This reaction may range from slight stomach cramps to diarrhea, nausea or vomiting – which may be attributed to certain changes of the intestinal microflora due to the new micro-organisms and unique substances introduced through drinking kefir. In most cases, individuals find that symptoms eventually clear up after a short period of time. Newcomers to kefir who may experience such reactions should begin taking lesser amounts of kefir, for instance, taking a couple of tablespoons of kefir daily, and increasing the amount by one to two tablespoons each day, until one cup of kefir can be well tolerated. Once this amount is well tolerated, in most cases, the individual can then take one to four or more cups of kefir daily, if required. How much Kefir can one drink? As much as you feel comfortable with. Many individuals may have one cup of kefir in the morning and one at night before bed time. Some individuals enjoy a small glass of kefir before each meal. One word of caution: like yoghurt, kefir contains lactic acid bacteria which can erode the tooth enamel, so be sure to rinse your mouth with water after consuming kefir, or after consuming food which contains lactic or acetic acid. Is it true that the grains grow? Yes, healthy kefir grains should grow by 5 to 15 % daily [by weight]. This enables generous people to share extra grains with others who are interested in the preparing the drink for themselves. Any tips on handling grains? Avoid exposing them to excessive temperatures, since some of the micro-organisms are quite sensitive to heating above body temperature. As a rule of thumb, milk that is too hot for you to put a finger in it, will surely kill your grains. What do I do if the grains become contaminated or pink spots appear on the surface of the cultured medium? This might happen especially if you covered the jar with a cloth, which might favour certain mold spores or weed micro-organisms to fall in the kefir. Simply strain the grains and rinse them in filtered water. “Fast” them in plain water for 24 hours in the fridge. Rinse the grains with fresh water and place them in fresh milk. You might want to discard the first batch of kefir, since it might still taste unusual. The second batch of kefir should be good enough to drink. I have problems drinking milk. What can I do to have kefir? you are lactose intolerant: in that case, leave your kefir to ripen one more day before drinking it. This will give time for the kefir bugs to digest more of the lactose [milk sugar] in the milk, and for the bugs to produce more lactase [the enzyme responsible for breaking down lactose which your body can then utilise to further break down lactose]. you pay caution to casein (the protein in milk). In such cases you might try different milks (goat’s and sheep’s milk has shown to be gentler than cows), or you may have to avoid dairy at the beginning, in which case you might like to try coconut water kefir. It’s Italian for water kefir [in Italy this form of kefir is more popular than milk kefir]. It is thought it was originally obtained by adapting some milk kefir grains to a new, water-based medium. It can be made to be fizzy and mildly alcoholic. How do you make kefir d’acqua? Water kefir is made by adding sugar, lemon juice and a dried fig/plum/date/apricot etc. to water and special crystal-like water kefir grains, which are quite different than milk kefir grains. See our Recipe Section for this. Can I make water kefir using ordinary milk-based grains? Water kefir can be prepared with milk kefir-grains. Use only a portion or extra milk-grains for this. First rinse the grains with filtered cold water and place them in a 5 to 10 % sugar solution. Add some lemon slices and brew for 48 hours at room temperature. Initially, the grains will take up to 4 days to begin brewing the new form of kefir. This is normal since they have to get used to the new medium. Please note that once converted to water, milk grains will stop growing and will no longer be able to produce milk kefir any more. So make sure to only use extra grains to make the water version, and always brew the two types separate from each other. Is it necessary to add all that sugar to kefir d’acqua? And what is the dried fruit for? If using milk kefir grains transferred to a water media, then it is suggested to feed the grains with a variety of different sugars. This helps maintain a diversified microflora in the kefir. Instead of dried fruit, you can add fresh fruit. The lemon keeps the solution slightly acidic and produces a lemonade-like flavour. Different fresh fruits will produce water kefir, which retains the flavour of that fruit. How long do milk kefir grains last? How long does the powdered Kefir Starter Culture last? If cared for properly, dairy grains have an unlimited life span and can be used repeatedly to make kefir. Powdered kefir starter culture can be used a number of times but the exact number is dependent on several factors including personal hygiene, cleanliness of the container and utensils (soap is detrimental to kefir culture), etc. If my house is colder than 68 degrees, will it take longer for the milk to kefir? Yes, cold slows down the fermentation process so it will take longer to make kefir. Alternatively, if your home is warmer than standard room temperature, the process will take less time. Do I need to stir the kefir during the culturing process? You can stir the kefir while it’s culturing but it’s not necessary. How will I know if I’ve successfully made kefir? How do I know if I shouldn’t drink it? When milk turns to kefir it thickens. We always recommend that you refrain from consuming anything that looks, smells or tastes unpleasant. The taste of finished kefir varies greatly based on the type of milk used (cow versus goat for example) and the length of time it is allowed to culture. Generally speaking, dairy kefir has a sour taste and an effervescent texture. If you have not tried kefir before, we would recommend purchasing kefir at the grocery store to try (generally located next to the milk and yogurt) before purchasing a starter culture. Can the milk kefir grains be cultured in goat milk or coconut milk? Many people have reported excellent results using dairy grains to make goat kefir and coconut kefir. How do I take a break from making milk kefir? To take a break from making dairy kefir simply place the grains in the fresh milk, place a tight lid on the container and place it in the refrigerator. The cold will greatly retard the culturing process and they can keep this way for up to several weeks. If at the end of that period you require more time, simply repeat the process with fresh milk. If you desire a longer break period, you can also dehydrate your dairy grains by placing them on unbleached parchment paper in a safe location (room temperature) for several days until they are completely dry. Then place the dehydrated grains in a secure glass container and keep in a cool dry place. They should keep this way for at least 6 months. If I’m making other cultured foods (yogurt, sourdough, kombucha, etc. ), how far apart do I need to keep the kefir culture? When items are being actively cultured (and don’t have lids), we suggest keeping a distance of at least several feet (and preferably more) between items. When your cultured items are being stored in the refrigerator with tight fitting lids, there is no need to keep distance between them. What ingredients go into making water kefir grains? I want to consume kefir but I’m allergic to dairy. Is water kefir a good alternative? Yes! Water kefir contains no dairy (please note: water kefir grains are processed in a facility where dairy products are processed). Are water kefir grains reusable? Yes, water kefir grains are reusable. Once your kefir is finished culturing, simply remove the water kefir grains and place them in fresh sugar water, juice or coconut water. With proper care, water kefir grains should last indefinitely. What is the process to make water kefir? Water kefir grains are added to sugar water, juice or coconut water, allowed to culture for 24-48 hours and then the kefir grains are removed. To flavor water kefir (we don’t recommend drinking water kefir made with sugar water without flavoring! ), simply add fruit juice or flavor extracts (i.e. vanilla extract) to the water kefir. If a more fizzy water kefir is desired, once the juice is added, bottle it up tightly and allow it to sit for a few days so the carbonation can build. Can I allow the kefir to culture for longer than 48 hours? We strongly recommend against allowing the kefir grains to culture for longer than 48 hours as over time it will damage the grains by potentially starving them (particularly in warm weather when the culturing process is sped up due to the heat). How will I know if I’ve successfully made water kefir? The primary test of whether or not you have successfully made water kefir is if the finished kefir tastes less sweet than the sugar water or juice you’ve started with. Finished water kefir will be fairly sweet (see below for information about sugar content). Depending on the type of sugar used, the amount of culturing time, etc., water kefir may also be slightly bubbly. We strongly recommend flavouring water kefir made with sugar water prior to consuming it as the taste of plain water kefir isn’t particularly pleasant. Flavouring options include fruit (fresh or dried), fruit juice and flavour extracts. Will water kefir grains multiply? Water kefir grains are known to multiply, but at times they are reluctant to do so and therefore we do not guarantee kefir grains will multiply. Even if they do not multiply, with proper care, water kefir grains can be used repeatedly to brew milk kefir. What amount of kefir grains do I need to make water kefir? 3 tablespoons of hydrated kefir grains will culture 2-3 quarts of water kefir every 24-48 hours. Where do I store my finished water kefir? Once the culturing process is complete and the grains have been removed, you can bottle up the finished water kefir with or without juice (15-20% juice is a good ratio) for several days to allow carbonation to build. Water kefir can be stored in a container with a lid. Options include canning jars, old wine bottles with new corks and other new items you can source on the market. Water kefir bottled in an airtight container with juice will generally be more carbonated than water kefir bottled without juice due to the higher sugar content. Is there any danger to using less sugar than is indicated by the instructions that came with my grains? Yes! Making water kefir requires a balance of ingredients to allow the kefir grains to properly culture. We recommend using a ratio of 1/4 cup sugar to 1 quart water when making water kefir. This ratio ensures the kefir grains are properly fed. Using less sugar (or culturing the kefir for longer than 48 hours) can cause the grains to starve. Over time, the grains will become less efficient and although you are using less sugar, you may actually end up with more sugar in the finished kefir than you would with efficient working kefir grains (see below for information on how much sugar actually remains in finished water kefir). Ultimately, using less sugar will result in unhealthy kefir grains and possibly higher sugar consumption for you. What type of water should I use to make water kefir? Generally speaking, the best water sources for making water kefir is mineral water. We do not recommend using distilled water or water filtered though a carbon-activated filter because these methods of purification remove a great deal of the minerals in the water which results in less healthy kefir grains. If you do not have an alternative source for filtered water and must use tap water, it is important to remove the chlorine either through boiling (15 minutes) or through aeration (e.g. placing the water in a container and allowing it to sit out overnight or running it through a blender). How do I take a break from making water kefir? To take a break from making water kefir simply prepare a sugar water solution (1/4 c. sugar to 1 quart water), place the grains in the sugar water, place a tight lid on the container and place it in the refrigerator. The cold will greatly retard the culturing process and they can keep this way for up to several weeks. If at the end of that period you require more time, simply repeat the process with fresh sugar water. If you desire a longer break period, you can also dehydrated your water kefir grains by placing them on unbleached parchment paper in a safe location (room temperature) for several days until they are completely dry. Then place the dehydrated grains in a secure glass container and in a cool dry place. They should keep this way for at least 6 months. When I rehydrate my kefir grains, I didn’t see any bubbles, is that normal? Yes. Although water kefir is characteristically bubbly, it can take a number of batches before bubbles are clearly viable. At this initial stage, any bubbles are likely to be too tiny and too infrequent to be noticed. My water kefir grains are multiplying rapidly. Is there a point where I must remove some of the grains? While only 3 tablespoons of water kefir grains are required to culture up to 3 quarts of water kefir, more grains will not harm the process (and we don’t recommend using less grains even when making less water kefir). However at some point, you will likely have so many grains taking up room in your brewing container that you must remove a portion of them as a practical matter (or you simply won’t have much kefir available). Extra kefir grains can be dehydrated (see above for instructions on taking a break from making water kefir) or given to friends and family. Can I use coconut water to make water kefir? Yes, coconut water can be used to make water kefir. Do I need to add sugar if I’m using young green coconut water? No, there should be enough sugar in the young green coconut water to feed the kefir grains. Old brown coconuts do not have the same effect because they do not contain as much natural sugar as the young green coconuts. Are there any precautions to take when making kefir d’acqua? 1. Kefir d’acqua is a fizzy drink. If you brew it in a tightly sealed jar, pressure will build up pretty fast. It is important to use a strong enough vessel to withstand the pressure, but especially to leave plenty of room in the jar for the gas to accumulate. Typically, you should leave your jar half full with the kefir ingredients. 2. Kefir d’acqua is a mild alcoholic drink – it may contain between 0.5 to 3 % alcohol per volume [depending on the amount of sugar and fermentation time]. So it might not be advisable to give to small children, or animals, and one should be careful when driving a car to avoid accidents. If using tap water, remove the chlorine prior to making water kefir by either boiling the water and allowing it to cool or by aerating the water using a blender. Dissolve sugar in a small amount of warm/hot water. Add enough cool water to almost fill the jar leaving 1-2 inches of headspace. When the water has cooled to room temperature, add the kefir grains and give the mixture a quick stir with a spoon. Cover tightly with a towel and rubber band to keep out fruit flies and ants. Allow the kefir to culture for 24 to 48 hours. 24 hours will yield a sweeter water kefir. However, if you are sensitive to sugar, culture the kefir for 48 hours to give the grains a chance to consume a larger portion of the sugar. Stir once or twice a day while the kefir cultures (optional). Do not let the kefir grains culture longer than 72 hours. As the kefir grains culture, you will notice tiny bubbles forming and travelling to the water surface. Once the kefir has finished culturing, strain off the finished liquid into a separate container with a strainer) and cover with a tight lid. Finished water kefir does not require refrigeration, but can be refrigerated if you desire a cold beverage. Add the grains to a new batch of sugar water and proceed with your next batch. Water kefir grains can be made using coconut water from young green coconut water. Simply add the grains to young green coconut water. Using the Kefir Grains to make Water Kefir is actually pretty easy. And the best part is you can grow as much as you need, and then keep making a fresh batch of Water Kefir for your entire family to enjoy each day. Add 1/4 cup Kefir Grains. Place a cap on the jar and let it sit for 48 hours so it can ferment and create the Water Kefir. After 48 hours, taste test it. If its too sweet, let it go another day. They can ferment up to 5 days. When the Water Kefir is cultured to your liking, you can strain out the grains, and now you can drink the Water Kefir. Rinse the grains well with room temperature water and repeat the process using the grains. You and your family can drink it every single day and it will only cost you just a few cents per day (kefir grain food – cane sugar, etc.) to make once you get your grains started. Coconut Water for Health and Healing: by Bruce Fife, N.D.
Dr. Bruce Fife is a certified nutritionist and naturopathic physician. He is considered the world’s leading authority on the health aspects of coconut and related products. He is the author of 20 books including Coconut Water for Health and Healing and serves as the director of the Coconut Research Center, www.coconutresearchcenter.org. You’ve been to the grocery store, picked up a coconut, and shaken it, right? The sloshing sound you hear inside is coconut water. Contrary to popular belief, this liquid is not coconut milk. Coconut milk is made by crushing and squeezing the liquid from coconut meat. What you get is a thick, creamy, white fluid that looks much like dairy milk. Coconut water, on the other hand, looks pretty much like ordinary water, although it may be slightly opaque. The two are completely different in taste, texture, nutrient content, and health benefits. Coconut water is sometimes referred to as coconut juice and is consumed just like any other fruit juice. Coconut water has a slightly sweet, somewhat nutty taste. Surprisingly, it doesn’t taste like coconut. It has a flavor all its own. Coconut water has long been the most popular beverage consumed in the tropics where it is considered not only a refreshing drink but a health tonic. Coconut water is a superfood filled with minerals, vitamins, antioxidants, amino acids, enzymes, and growth factors. It is low in fat and has only a fifth of the sugar found in most fresh fruit juices. One of the most remarkable characteristics of coconut water is its chemical profile and mineral content. The primary minerals or electrolytes in coconut water are essentially the same as those found in human blood. For this reason, doctors have used it as an intravenous fluid for rehydration, pumping it directly into the patient’s bloodstream. Numerous studies dating back over 60 years document the successful use of intravenous coconut water in the treatment of malnutrition and dehydration. Since coconut water has a pleasant taste, it has also found use as an effective oral rehydration beverage. Doctors have found it to be highly useful in fighting dehydrating diseases such as cholera, dysentery, and influenza, where it has saved the lives of thousands of children in underdeveloped parts of the world. Coconut water’s similarity to body fluids and its usefulness as an intravenous and oral rehydration fluid has spurred interest in the sports community. With properties which are in many ways superior to commercial sports drinks, coconut water is now becoming popular as a natural rehydration beverage among athletes. In fact, it is popularly known as “Nature”s Gatorade. Coconut water is available at most good health food stores and, as its popularity continues to grow, is finding its way into many grocery stores. It comes packaged in easy-to-carry cans, bottles, and tetra paks. Tetra paks are the most convenient because you don’t have to worry about them breaking. You can take them with you anywhere, even when you work out, go camping or hiking, or go to the football game. If you freeze them beforehand, they will stay cold for hours, providing you will a cool, refreshing drink later in the day. You can also get coconut water straight from a fresh coconut. You want to make sure you get a “young” coconut. Young coconuts are those that have not fully matured. The water in the mature brown, hairy coconuts you see in the grocery store is too old and tastes much different. Whole young coconuts are also sold in health food stores. They look different from the mature brown coconuts. When a coconut is harvested from the tree it is covered in a thick fibrous husk. The husk is usually removed before being shipped to market, so you never see the husk, just the brown shell. Young coconuts, however, have only a portion of the husk cut off, leaving about an inch covering the shell. The husk is white and often shaped like a large toy top, with a point on one end and flat on the other. They are perishable, so you will find them in the refrigerated section of the store.